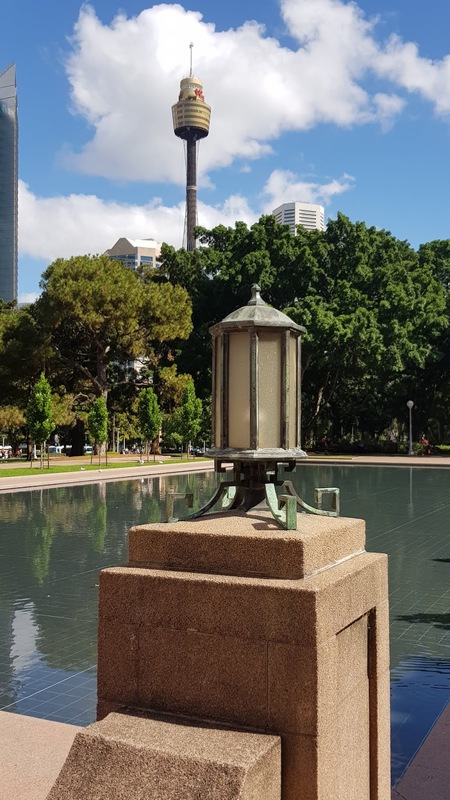 Looking past a lamp at the Pool of Reflection in Hyde Park South, in front of the Anzac War Memorial, towards Sydney Tower. The pool was built as a memorial to the Australian Imperial Force of World War 1. Linked to: Theme Day, Skywatch Friday. Great view of the reflecting pool and tower. Happy Thursday, enjoy your day. Have a great weekend ahead. Be careful what you wish for, Stanley. Yesterday was the hottest day in the past year with 40°C (104°F) in the city and hotter in the suburbs. Hottest January on record. Again. The pool looks calming and restful, a fitting memorial for those who deserved peace but sacrificed everything. It's very nice and a good idea to have in front of the memorial. A lovely composed photo. Hope you are staying cool! It looks so nice and warm to me, Jim!